I always feel it is invaluable to consider the lives and the culture of those who have much less than us. It changes the way we view money and view the things that we have. When I was in college, I went on a cross-cultural missions trip to Egypt which ultimately changed the way I view giving to others. On the trip, I met a guy named Ted Oswald who immediately struck me as someone far more intelligent than me, and someone who had a sincere love for grilled cheese sandwiches. Another love of Ted's (besides food) has always been social justice and serving the urban poor. I was very excited to hear that he was working on, and has finished up a book based in Haiti. One Amazon book reviewer said it "takes the reader into the heart of Haiti's political, social, and cultural climate". 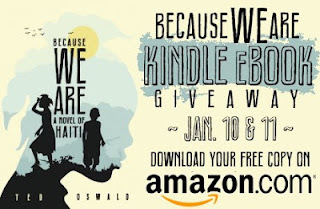 Up until midnight, you can download a FREE copy of his eBook "Because We Are: A Novel of Haiti". Currently, I'm anxiously awaiting the physical copy of the book to arrive at my house. In the meantime, download your own copy. I have no doubt it will entertain you and challenge you. Book Description: When a mother and her infant are murdered on the outskirts of Cité Soleil, Haiti’s most infamous slum, two unexpected detectives emerge: Libète, a brash and headstrong girl of ten, and her brilliant but impoverished friend Jak. Though made rough-and-tumble on the slum’s streets where gangs, police and UN peacekeepers have long battled for control, the murders stir Libète unlike anything she’s seen before. With the dead quickly forgotten as the community limps on in its grinding struggle to survive, Libète resolves to pursue the truth despite the costs, plunging headfirst into an insidious plot that will threaten her and everything she holds dear. Click here to download your e-edition free!